View More In Pistachio Nuts. The Original Blend on fire. Better get the hose! Made with jumbo size U.S. Extra #1 pistachios from California, first cold pressed extra virgin olive oil and a proprietary blend of whole herbs and spices including garlic, habanero pepper, cayenne pepper, turmeric, onion, oregano, black pepper, smoked paprika, parsley, cumin and sea salt. 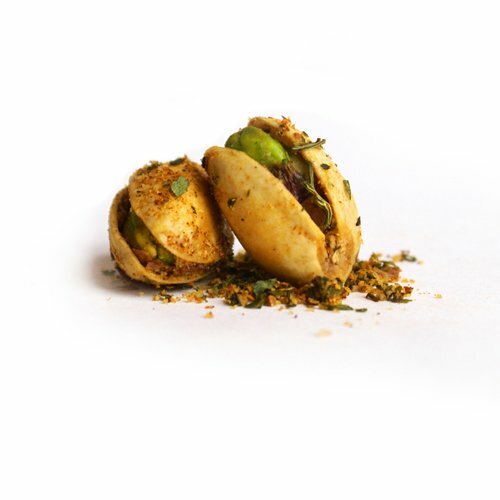 Our gourmet pistachios are made with 100% naturally opened pistachios and whole herbs and spices from California farms and suppliers. If you have any questions about this product by The Gilded Nut, contact us by completing and submitting the form below. If you are looking for a specif part number, please include it with your message.